The British empire is at the height of its power, but it is just about the enter the terrible World War 1. The peoples of the British Isles have made their first appearance in written history with Julius Caesars' invasions of 55 and 54 BCE. 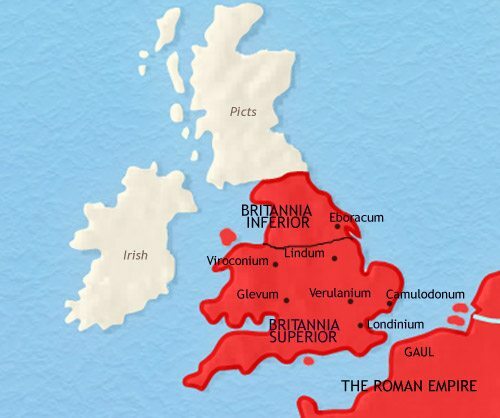 A Roman province now covers the southern half of the British Isles. The Roman province is no more, as is the Roman civilization which it nourished. 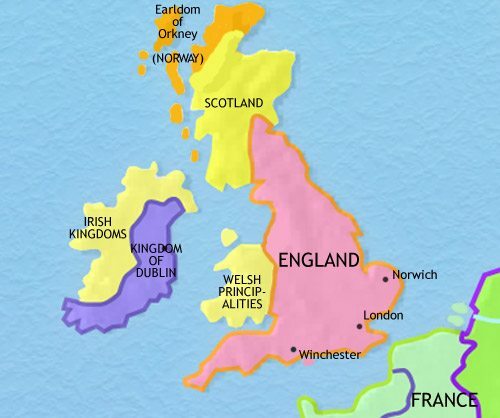 A collection of Anglo-Saxon kingdoms now covers most of present-day England, and the rest of the British Isles is home to numerous Celtic tribes and kingdoms. Viking attacks have affected all the peoples of the British Isles, but in England they have been overcome by the Anglo-Saxons under the kings of Wessex. 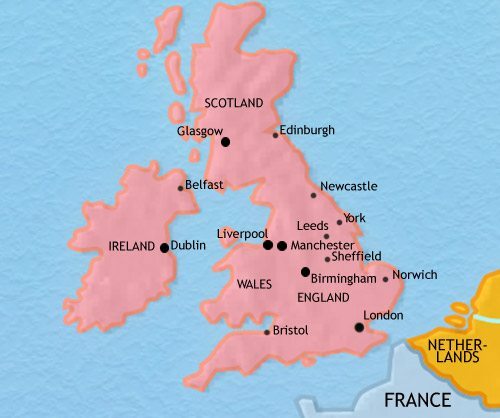 The British isles at the time of Magna Carta, when a line of French-speaking kings and their followers have established themselves as a ruling class in England, and are encroaching into Wales, Ireland and Scotland. The British empire has started to expand around the world. The British empire has expanded as a result of the Napoleonic Wars. The British empire has expanded vastly under Queen Victoria. Britain has by now lost most of its empire. Over the past four decades, the British empire has expanded hugely, particularly in Africa. Nearer home, Britain adopted a policy of isolationism towards her European neighbours for many years, but rising tensions on the continent forced her to ally herself with France and Russia against Germany and Austria. She became involved in a dramatic armaments race with Germany, and the two powers built up huge fleets facing one another across the North Sea. Now, these tensions in Europe, which have led to German armies invading Belgium, have forced Britain into the World War 1 (August 1914). At home, recent years have seen further political and social reform. The House of Commons has become the pre-eminent seat of legislation, trade unions have been legalized, more citizens have become eligible to vote, elementary education has become freely available, conditions at work have continued to be improved and the first old age pensions have been introduced. However, there is growing discontent with British rule in Ireland, and women throughout Britain are still excluded from having the vote. The past few centuries have seen the rise of powerful Celtic chieftains, indicated in the archaeological record by the appearance of large hill forts. British culture, reflected in the decorated helmets, shields and jewellery of the time, has been closely related to the Celtic La Tene culture of the continent. The peoples of the British Isles are now being drawn more closely into the light of history. In 55 and 54 BCE, the Roman General Julius Caesar arrived with a sizeable Roman army – the first event in British history recorded by contemporary writers (in this case, Caesar himself). The Roman army did not stay long, but other immigrants did. 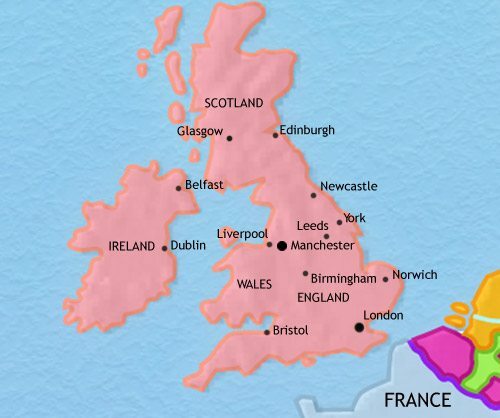 In the past century migrants from north eastern Gaul have settled in the south east corner of the British Isles. This migration has probably been in response to pressure, first from German tribes from beyond the Rhine, and then, Roman armies under this same general, Caesar. They have brought with them a higher level of material culture, with heavier ploughs, the potter’s wheel, and a higher level of social and political organization, and these advantages have enabled them to establish large tribal kingdoms in the area. In 43 CE the Romans invaded Britain again, and this time stayed. They expanded out from their Bridgehead in Kent but, in 61, a major rebellion broke out in what is today East Anglia, and was only with difficulty put down. By the 70’s the Romans had occupied all the southern half of the country. 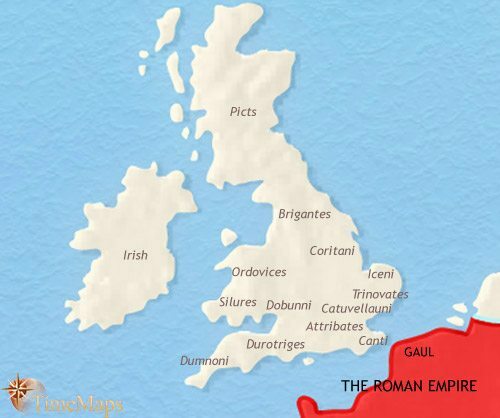 By then the South East and Midlands was dotted with numerous self-governing, Roman-style towns complete with forums, temples, baths, amphitheatres and so on. The elite were at least partially Romanized. Villas scattered throughout the countryside show their increasing prosperity as they grew in size over the generations. The North and Wales were more militarized, covered by a network of military roads connecting a multitude of forts, large and small. Hadrian’s Wall, built in 122, guarded the northern frontier. Away from these centres of military power, the Britons of Wales and the North lived largely as they had before the Romans came. Britain escaped the worst of the troubles of the third century, and the first half of the fourth century was a period of peace and prosperity – some of the largest and most beautiful Romano-British villas date from this time. In 367, invasions from both Scotland and Ireland overwhelmed the frontier defences, but seem not to have penetrated to the south. Prosperity continued until the Roman government withdrew its protection in 410. Soon after, a combination of renewed Pictish, Irish and now Anglo-Saxon invasions caused great destruction, from which Romano-British civilization, always confined to the towns and villas, never recovered. From the mid-fifth century, Anglo-Saxon tribes began to migrate in large numbers into southern and eastern England. With trade severely disrupted, the old Roman administrative apparatus moribund, and the newcomers hostile to urban civilization, the hallmarks of Roman life – towns, villas, the Latin language, literacy, Christianity – fell into steep decline. These had all but vanished by 500. 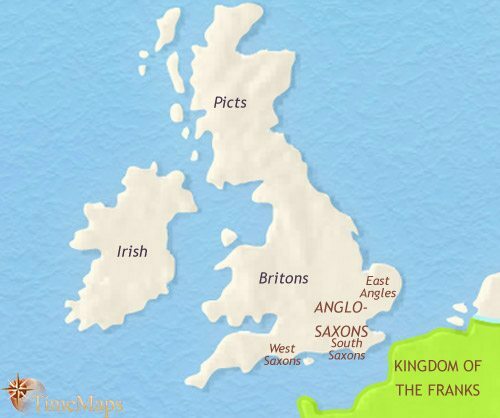 The Anglo-Saxons established a multitude of small kingdoms in eastern Britain. By around 600 these had coalesced into a small number of larger kingdoms. 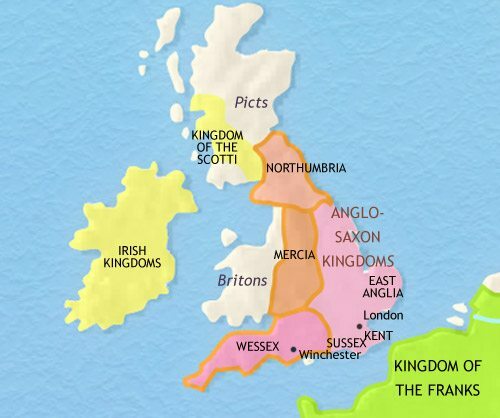 These kingdoms – Northumbria, Mercia and Wessex – gradually extended their territory westward as they incorporated more and more lands of the Britons. From the end of the sixth century, the Anglo-Saxons began converting to Christianity. To what extent this religion had survived from Roman times is a matter for debate. 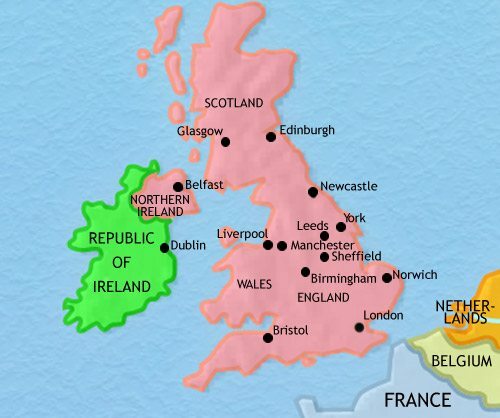 What is clear is that the Irish were converted to the new religion in the fifth century, and from the sixth century they began sending missionaries to Scotland (where an Irish tribe, the Scotti, had established a kingdom) and northern England. In 597 a mission sent by the Pope in Rome, led by the monk, Augustine, also appeared in the south of England. A sort of pincer movement led to the Anglo-Saxons receiving missions from north and south, and by the end of the seventh century all of England and Scotland had become Christian. The Synod of Whitby (664) had led to all Christians in England accepting the practices of the Roman church, as was the case in most of western Europe. The kingdoms of the British Isles came under severe attack from Viking raiders from the end of the 8th century onwards. No area was safe, and large numbers of Norse (as the Vikings were called) settled in northern England, northern Scotland and Ireland. At this date, large parts of Scotland and Ireland are still under Norse control. In England, the Norse attacks led directly to the disappearance of all the Anglo-Saxon kingdoms except Wessex. 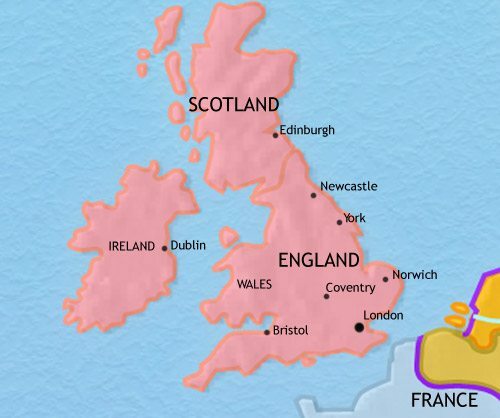 However, the kings of Wessex, starting with Alfred the Great (reigned 871-899), have fought the Vikings back and have succeeded in uniting the whole of England – plus southern Scotland – under their rule. Anglo-Saxon rule was brought to an end when duke William of Normandy defeated the last Anglo-Saxon king, Harold, and installed himself as king of England in 1066. William and his French-speaking followers established themselves as an alien ruling class, controlling the native Anglo-Saxon population from the many castles they erected throughout the land. In subsequent generations this military caste has expanded its control into parts of Wales and Ireland. In both places it has met fierce resistance. 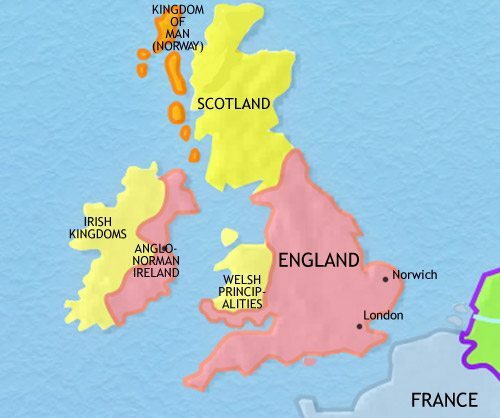 Anglo-Norman barons have established themselves even in Scotland, where the Scottish kings have wished to curb the power of the native nobility. In 1158 the count of Anjou, Henry Plantagenet, came to the English throne (Henry II, 1158-89). Together with his French territories, as well as his conquests in Ireland, Henry’s lands were far more extensive than those of the king of France (even within France itself). Under Henry’s son, John, however, most of the French territories were lost. John’s unsuccessful, and expensive, efforts to win them back led him to harshly extort revenue from his barons. These have rebelled and forced him to sign an agreement guaranteeing royal respect for their rights (Magna Carta, 1215). The signing of the Magna Carta was the start of a political evolution in England which saw parliament, including members elected by the towns and shires, becoming an important element in government. The development was driven by the need to pay for wars with the Scots, Welsh, Irish and, above all, the French (above all in the so-called 100 Years’ War). Apart from the occupation of Wales and past of Ireland, these achieved little. By 1453 the nation, defeated in France, was demoralised. Resentment with royal government was deep and widespread. The stage was set for civil war. The British Isles were deeply affected by the Black Death (1349). For the survivors, this tragedy caused the standard of living for the bulk of the population to rise considerably, spurring the end of feudalism and the expansion of commerce. England fell into a long bout of violent political instability in the period known as the Wars of the Roses (1455-85). The main players in these wars were powerful and turbulent nobles, so, when the Tudor Henry VII triumphed (reigned 1485-1507), he set about curbing their power and centralizing government in his own hands. His son, Henry VIII (reigned 1509-47), brought the Reformation to England, which resulted in years of religious strife before a compromise settlement was introduced under Queen Elizabeth (reigned 1553-1603). This confirmed England as a Protestant country but left people by and large to follow their own consciences. Elizabeth’s reign saw a dangerous war with Spain, in which England came close to being invaded by a great Spanish Armada (1588). The reign also saw a glorious period in English literature, above all in the work of William Shakespeare. In 1603 the Scottish Stuart kings came to the English throne. The early years of their rule saw a continued expansion of trade, the colonization of large areas of Ireland, the beginnings of the settlement of America, and also a growing rift between the extravagant Stuart court and the Puritan-dominated parliament. In 1642 this rift broke out into a series of Civil Wars, which involved England, Wales, Scotland and Ireland. By 1648 parliament had triumphed. With parliament’s victory in the Civil Wars (1642-51), England became a republic, under the rule of Oliver Cromwell. After Cromwell’s death (1658) anarchy threatened and Charles II was invited back to take the throne (1660). Tensions between king and parliament re-emerged, however, which ended in the “Glorious Revolution” of 1688, when parliament invited the Dutch Prince William and his wife Mary to take the throne. This led to parliament finally becoming the dominant element within government. 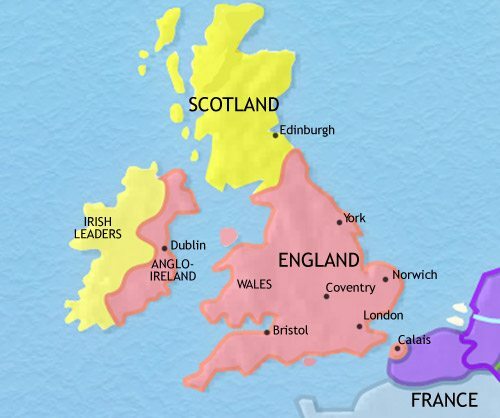 In 1707, England and Scotland were united in one kingdom, with one parliament. Throughout the late 17th century and the 18th century, Britain’s overseas trade expanded and her world-wide empire grew. The country fought a series of wars with other European countries, notably France, for control of far-flung colonies in America and India. Britain emerged victorious in each case, mainly thanks to her superb navy. However, in 1776 her North American colonies declared their independence, and, with France’s help, successfully defended it (War of American Independence 1776-83). This set-back only temporarily interrupted British economic expansion, which had, throughout the period, been accompanied by scientific and technological advances. By 1789, the Industrial Revolution had began, a development which would in due course utterly transform first Britain, then the world. The independence of the United States also barely interrupted the onward march of the British Empire around the world, at this period particularly in India. The Industrial Revolution has been transforming much of the landscape of the Midlands and the North of England with smoky factories, huge new industrial towns, canals and now, in their infancy, railways. The social landscape is also changing as a large new urban working class appears, accompanied by an expanding middle class. The political landscape, hitherto dominated by the old landed aristocracy, begins also to change: the Great Reform Bill of 1832 is the start of a major process of democratization which will end several decades later with all British adults having the vote. Abroad, the long Napoleonic Wars (1793-1815) saw great British victories against the French, most notably at Trafalgar (1805) and Waterloo (1815). Britain ended the wars as one of the leading powers in Europe, her navy in complete control of the seas, and a larger overseas empire than before, with the expansion of her territories in India and Australia and new additions in South Africa and the East Indies. This year (1837) sees Queen Victoria begin her long reign. For Britain, this period is known as the “Victorian Era”, named after the queen who has now sat on the throne since 1837 and who will continue to do so for three more decades. Her reign so far has seen the further expansion of the British empire in India (despite the British coming near to losing control in the Great Rebellion of 1857), and in Africa, in the Far East and in the Pacific. Britain’s economic influence reaches even further, with British financial power at work from South America to China. London is the commercial and financial capital of the world. 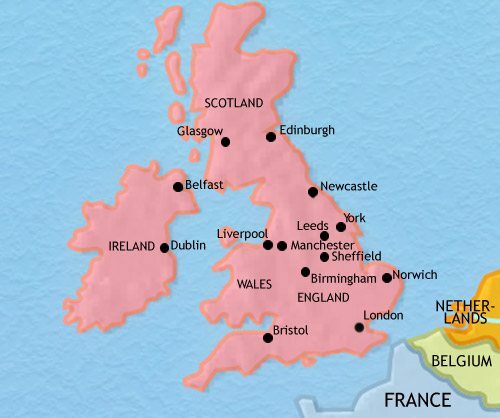 At home, Britain is now criss-crossed by a network of railways connecting the main towns. She has continued to see democratic political change, as well as the rise of a professional civil service, the appearance of elected local councils served by local government officials, the introduction to her cities of street lighting, clean water supplies, effective sewerage arrangements, large hospitals, more humane prisons, public parks, libraries, baths and a host of other civic amenities. Immediately after World War 1 (1914-18), Ireland successfully broke free from British rule (1920) and a little later women received the vote (1918). High unemployment blighted the industrial scene in the post-war years, made worse in Great Depression of the 1930’s. World War 2 (1939-45) saw the inspirational leadership of prime minister Winston Churchill, the mass bombing of all Britain’s major cities and the total mobilization of her economy and society for war. The post-war years saw the government nationalize many major industries, and set up a comprehensive welfare state. With the assistance of the USA, Britain’s economy slowly recovered. However, exhausted by two great wars, dwarfed by the two new superpowers – the USA and the Soviet Union – and unable to hold on to its empire (India became independent in 1947 and other countries would soon follow), Britain had by now lost its leading place on the international scene. This was underlined by the Suez affair in 1956, when, attempting to defend its interests in the Suez Canal, Britain was firmly told to leave well alone by the American government. In the 60’s and 70’s Britain let go most of her remaining overseas territories. These years also saw Britain become a cultural trend-setter to the world, symbolised by the emergence of the Beatles as a global phenomenon. However, constant strikes and economic underperformance continued to drag Britain’s prosperity down. Long-lasting troubles in Northern Ireland completed a rather dismal picture. Britain joining the EU in 1973 seemed to make little difference to the malaise. In 1979 a new government led by Margaret Thatcher set about tackling a range of long-term issues to make Britain a more competitive place for business. She also famously sent a task force to retake the Falklands Islands in a short, sharp war against Argentina (1982). Her government liberalized the London Stock Exchange (1986), which led to London again becoming one of the world’s leading financial centres. The government of Tony Blair, her Labour successor, devolved much more power to Scotland and Wales, and presided over a peace agreement in Northern Ireland. The Republic of Ireland joined the EU in 1973 and, unlike Britain, joined the Euro in 2002. This has sparked an economic boom.